Understanding basic electrical theory is an essential prerequisite to performing your work safely. Mike's products help you understand what electricity is, how it's produced and how it's used. Everyone who works with electricity needs to understand how and why it works. This textbook is the first step in gaining that understanding. Each unit is organized to include an introduction, graphics, examples, calculations, formulas, a conclusion, and practice questions. 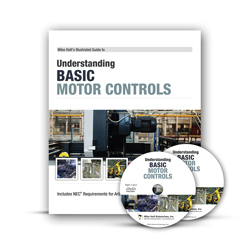 The textbook explains how to read and understand basic motor control schematics. It helps students understand the equipment represented by the symbols in the schematics, and how motor controls are used in practical applications. It teaches a great foundation of motor controls based on frequently used and common applications. It also contains many NEC requirements for the disconnecting means, controllers, wiring methods used to install the control wiring, the installation of equipment enclosures, and the overcurrent protection for the conductors, and the equipment being installed. The DVDs enhance the learning experience. 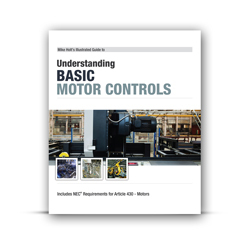 The study of motor controls is an extensive and complicated subject. This textbook is designed to provide a foundation for students who are just beginning to learn about motor controls. It can also be helpful for journeyman and master exam preparation. It teaches a great foundation of motor controls based on frequently used and common applications. Today's electronic technology requires power that is sufficiently free of voltage and current disturbance so as not to cause undue energy waste or heating of supplied equipment. 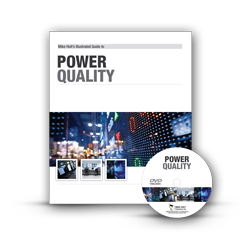 This DVD package provides the foundation necessary to understand the power quality and reliability issues and solutions, causes of harmonic problems, which solution(s) to apply, and when to call an expert. 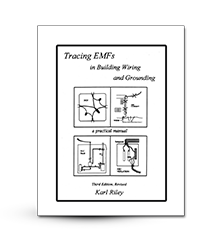 This book by Karl Riley is a trouble-shooting guide for electricians who are asked to find the sources of unusual AC magnetic fields in buildings; absorbing the material in this book will enable you to know how to proceed to reduce or eliminate those fields. The Ohm's Law Wheel shows the graphical, visual relationship between voltage, current, resistance and power in a direct current electrical circuit. Know two values, and determine the third. Keep your sticker handy to help you and to jog your memory. 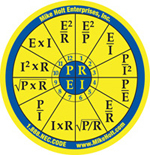 Order Mike's stickers as a great giveway for your students or employees. Mike Holt’s Changes to the NEC DVD Program will give you the tools you need to learn the most essential Code changes quickly and easily. If you want to become an expert on the Code Changes, then order this program today! Mike makes it easy to learn the Code Changes with this simple-to-use Illustrated Guide. If you need to learn the new Code, you need this book. The perfect reference for Code Change or CEU classes. Order your copy today! The Ultimate Training Library is your complete toolbox for electrical training. 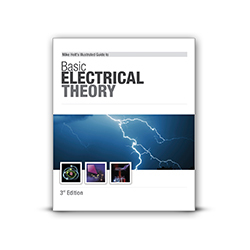 This best-selling program covers everything you need to know in the areas of Theory, the National Electrical Code and Electrical Calculations. It’s a great product for teaching new employees the Code, for preparing for a state or county electrical exam, for updating yourself and your team on the Code changes, or simply to review the fundamentals that every working Electrical Professional should know. Whether you use this for In-House Training or as a personal development tool this library will give you the edge for your business, and your career. This program is designed to help all learners: Inspectors, Engineers, Estimators, Instructors, Contractors and Electricians. In this best-selling program Mike captures his knowledge into one systematic training system. It is effective because it combines Mike’s unique direct writing style along with a series of DVDs. Mike’s ability to translate the Code into everyday terms has made this program a wonderful tool for individuals wanting to be knowledgeable about the National Electrical Code. This program includes both Volume 1 and Volume 2 of Mike's Understanding the National Electrical Code as well as the NEC Exam Practice questions to help you review and test your comprehension. Due to the extensive content of Article 690, that article is covered in Mike Holt’s Understanding the NEC Requirements for Solar Photovoltaic systems. You can view our products covering Article 690 by clicking here. Our best-selling Understanding the NEC DVD program has helped thousands of electricians learn the Code. The combination of the textbook with the DVDs makes it an easy and powerful learning tool. 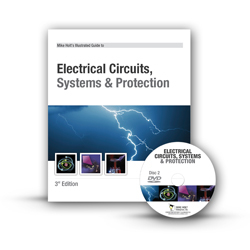 No other textbook takes you step-by-step through NEC articles like Mike’s authoritative Understanding the National Electrical Code textbooks. This resource has proven itself in the field and in the exam room, and you can rely on it to provide you with the rock-solid foundation of NEC knowledge you need to do your job with accuracy and confidence. Volume 1 highlights Article 90, Chapter 1, Chapter 2, Chapter 3 and Chapter 4. Volume 2 covers articles 500 through 820. NOTE: Due to the extensive content of Article 690, that article is covered in Mike Holt's Understanding NEC Requirements for Solar Photovoltaic Systems textbook. Volume 2 highlights Chapter 5, Chapter 6, Chapter 7, and Chapter 8. Today most states require a license to work on low voltage. Prepare for your upcoming Low Voltage exam with this great study program, or simply brush up on your NEC knowledge and expand your understanding of electrical theory and limited energy. 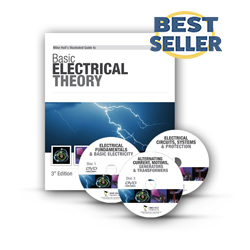 This program includes Mike's Basic Electrical Theory textbook and three DVDs to help you learn Electrical Fundamentals, Circuits, Alternating currents and more. 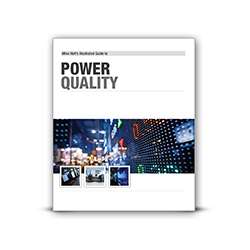 The Limited Energy book and DVDs will teach you what you need to know about the NEC requirements governing these limited energy applications. Subjects include definitions, general installation requirements, and specific requirements for low-voltage systems. The book includes practice questions, quizzes and a final exam. This full-color, illustrated textbook with corresponding DVD provides insight into many of the technical rules of the 2014 NEC that apply to limited energy systems. Subjects include definitions, the general NEC installation requirements, and specific NEC requirements for control, sound, video, CATV, CCTV, antennas, telephone, fiber optics, etc. Topics include grounding, cable installation, spacing, support, etc. This program is suitable for Low Voltage exam preparation; the textbook includes practice questions, quizzes, and a final exam. Finally there is a book that is devoted exclusively to all NEC requirements that directly relate to fire and electrical shock hazards. These essential rules were chosen by Mike as the most relevant safety rules that every electrical professional needs to be aware of. This is a great reference tool for code compliance, electrical training, and is ideal for weekly safety meetings. NFPA 70E® compliance saves lives, reduces liability, and helps avoid unexpected downtime and revenue loss. Now, the 2015 Standard takes another big step in changing the way America works. The perfect package for anyone working in the electrical industry: The NFPA Code Book comes with Mike Holt's best-selling Understanding the National Electrical Code textbooks, Volume 1 and 2 to give you a complete understanding of the NEC. Also included is a set of Mike Holt tabs. This special package includes the NEC Spiral Bound Code Book, Mike Holt's NEC Tabs, and Mike Holt's Illustrated Changes to the NEC Textbook and DVDs.